In line with Malaysia’s aim to become an inclusive and sustainable advanced nation by 2020, Green Technology (GT) has been identified as one of the drivers of the future economy for the nation that would contribute to the overall Green Growth and Sustainable Development. Under the National Green Technology Policy, the cross-sectoral GT focuses on four sectors namely energy, building, waste management and transportation. 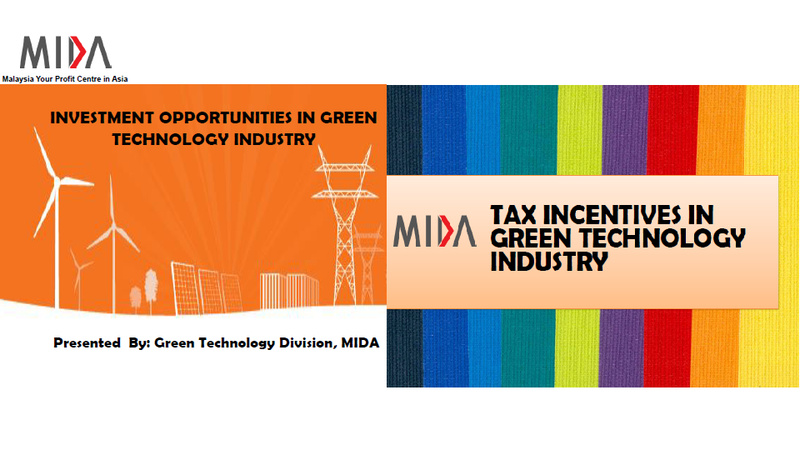 In this document, it showed how can we invest to the Green Technology Industry and it gives opportunities for everyone who are interested in. ※To Download the brochure Register Membership（Free）is required. ・In this topic, Tax Incentives for Green Activities are posted. ・To strengthen the development of green technology, the Government will continue to provide incentives in the form of investment tax allowance for the purchase of green technology assets and income tax exemption for the use of green technology services and system. ・In this topic, Eligible Company and Eligibility Criteria is posted in details. ・Waste Eco Park (WEP) aims to promote waste recycling, recovery and treatment activities by the industries and provides a sustainable solution to waste management problem. ・In this topic, the application procudure for investing in Green Technology Industry is posted in details. ・In this topic, Criteria of Verification by MGTC(Malaysian Green Technology Corporation) is posted in details. ・In this topic, Guidelines on Electricity Supply Licensing are posted in details.